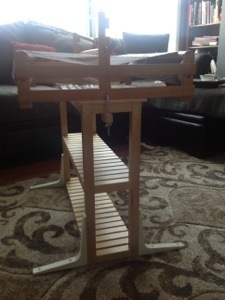 I weave with smallish rigid heddle looms. I don’t have house-space for a floor loom, and I find I like the limitations that a 24 inch width imposes upon me. I started with a 15″ Schacht Cricket, but I found that the 15″ width didn’t give me the bandwidth I wanted. I’m still learning my technique, so by no means expert, but so far, I’m 95% happy with the used Leclerc Bergere I found on Craigslist. The 5% dissatisfaction comes exclusively from the fact that the Bergere does not have a stand and does not have the notches for propping it between body and table like a Cricket. It required me to stand at the loom, and I couldn’t come up with a good place to weave with it. The dining room table (30″ tall) was too low and gave me back and neck aches. My cutting table (36″ – counter height) was too tall and I couldn’t see the work as easily. Both were too wide to effectively clamp or tie the Bergere down, so it kept wanting to skid or shift, which was making my tension wonky. I sort of knew what I wanted, from building furniture before. Chair seats are usually 17 to 19 inches from the floor, and tables run 28 to 31 inches tall. The loom is 5 inches tall at the beams (front and back) and 11 inches tall at the castle (where the heddle rests.) 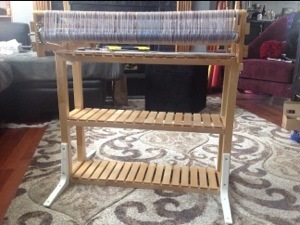 I wanted to be able to steady the loom with my feet and I wanted whatever stand to be the width of the loom (26 inches) so it could be clamped. The stand also needed to be petite enough that it can stow away, deep enough that it is stable and light enough to move around easily. When in doubt, go through IKEA’s website, looking for something. This is so simple, it doesn’t even feel like much of a hack. I bought one Molger wall shelf and four Ekby Stodis shelf brackets. 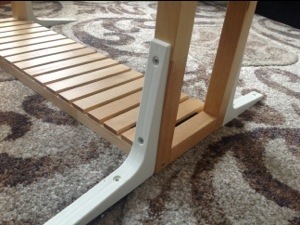 I assembled the shelf per instructions, put it on the hard-surface floor (don’t do this step on carpet or the legs may not be straight) and clamped a bracket on each upright. I drilled pilot holes then screwed the brackets to the uprights. This almost worked, but the Bergere has six legs — one at each corner and one in the middle of each side. These legs are only 3/4″ inch tall, but they’re necessary because the Bergere has a metal cross-brace to help prevent the loom from warping under the tension of the warp. I can’t either cut off the legs or remove the cross-brace. 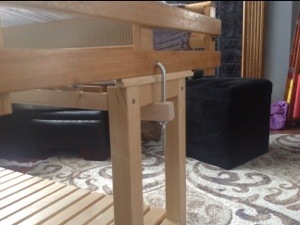 There’s no good place on the loom to clamp it to the stand without it being wobbly. Enter 4 small pieces of craft wood. I intend to drill a few more holes in the middle shelf of the stand, so that I can insert dowels to serve as spool spindles, and I’m thinking of building a couple of square-bottomed bags (think paper bag, but cloth) that I can secure to the two shelves for storing spools, shuttles and pickup sticks, but that’ll be when I’ve spare time. Right now, I’m just happy to have the loom at a comfortable height. And yes, it is comfortable — I’ve used it while sitting on the grey sofa, and while sitting in the red chair, but the best seat so far is the black foot stool.